Commercial and Industrial Loans are a good measure of bank lending to small and medium-sized businesses, the ones that don't have easy access to the huge corporate bond market. 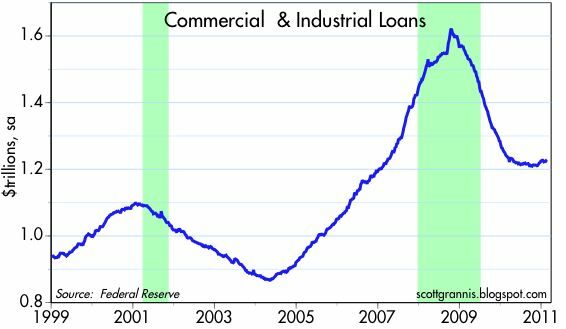 After two years of a severe contraction, in which C&I loans shrunk by 25% ($400 billion), a rebound is finally underway. Over the past three months, loans have risen at a 6.1% annualized pace, after zero growth for most of the second half of last year. It's still small potatoes in the great scheme of things, but it nevertheless marks an important inflection point. Instead of shunning new lending, banks are now expanding their balance sheets; instead of deleveraging, businesses are now in the mood to borrow. It should be clear from this chart that recoveries are not dependent on an increase in bank lending. Indeed, most recoveries in their initial stages are characterized by deleveraging, as companies shore up their balance sheets in preparation for renewed growth. So the message of the recent increase in C&I loans is not that the recovery is finally getting underway, it's that business balance sheets are healthier, business excecutives are more confident in the future, and banks are once again in the mood to lend. All of this will help sustain the recovery in the years to come. Please tell me which banks are loaning to businesses because I cant find one. It has been my experience that banks are just loan servicers these days rather than lenders. In my experience, they will not even extend credit lines which have been faithfully and timely paid. "All of this will help sustain the recovery in the years to come." Most small businesses can only borrow against collateral, that being property. All the more reason why we need a real estate recovery. That will give banks something to lend against. Just the opposite of what the set up was two to three years ago, that perfect storm that broke in the past, we are currently in place for the perfect wave. The only thing we are really lacking is the slathering on of a thick layer of surf wax by the friends with the negative demeanor. What are you currently buying these days? Actually, for personal reasons, I have been buying Thai farmland for the last several years. It has appreciated, but then if you are a farmer and you sell your land, you have no more business. In other words, it's up on paper only. I think Thailand has a great future, both for farmers and as manufacturing platform. Japan recently announced it needed 700,000 skilled Thai workers for plant expansions in Thailand in the next 10 years. Thailand only has a pop of 60 million, so you can see how big this is. I guess Japan is going to use Thailand to compete head to head with China manufacturers. Back in the US I think equities and property are fine. I am a bit jittery about oil, so maybe you want some oil stocks for leavening, or play long on the NYMEX. This is amazing like the previous one.. Thank you for this article..
Amazing news for people. I appreciate the work you are doing, people need to know more about loan in order to gain benefit for their better future. I will bookmark your site for more future reference. Small business loans can be used for a variety of things. The use of the money will be determined by the owner. Most people take out small business loans in order to fund the start up of a company in some way. Other people take out these loans when they need to do some repair or reconstruction work on the company. In the end, it is the owner or borrower that determines what the money will be used for and essentially in can be used on anything that has to do with the business.